The King of Wands sits on his throne, holding a blossoming wand in his hand, a symbol of life and creativity. His throne and cape are decorated with lions and salamanders, both symbols of fire and strength. The salamanders biting their own tails represent infinity and the ongoing drive to move forward against all obstacles. The King of Wands represents pure fire energy in its masculine form. 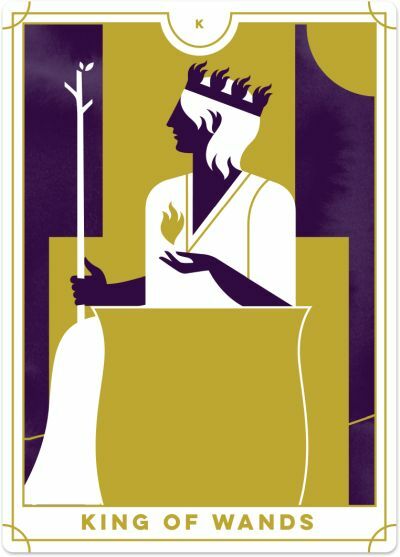 Unlike the other Wands court cards, the King is not so interested in creation and creativity, or in dreaming up ideas and implementing them himself. Instead, he is more inclined to take an idea and then enlist others to help him actualise it. 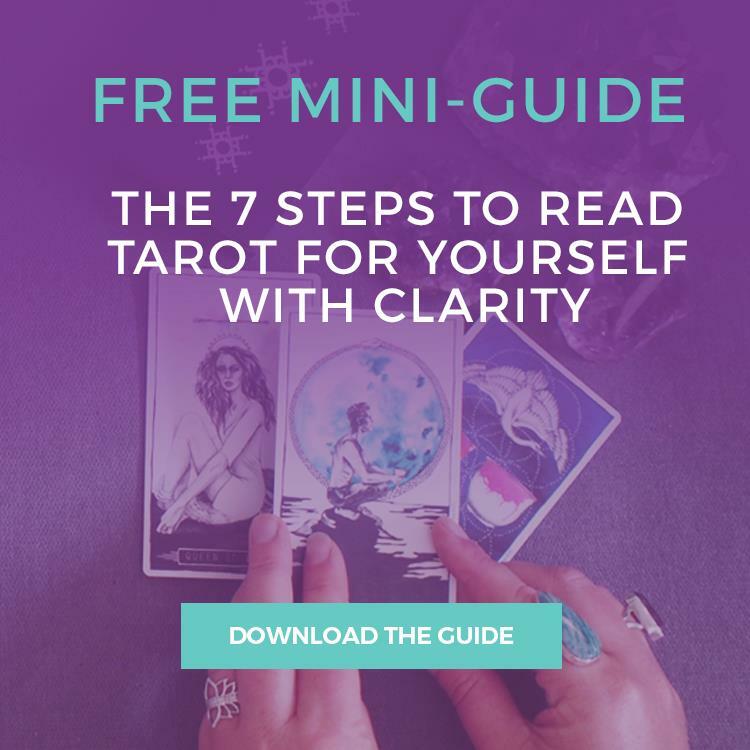 Thus, when the King of Wands appears in a Tarot reading, it is a sign you are stepping into the role of a visionary leader, ready to direct your people towards a common goal. You have a clear vision of where you want to go, and now you are manifesting that vision with the support of those around you. Others naturally gravitate towards you because you are charismatic, focused, and determined, and they believe in you and your vision. They want to be a part of what you are manifesting and are here to support you one hundred percent of the way. You are also masterful at getting other people to do your work for you while keeping them on-side throughout the process. The King of Wands reminds you to lead your life with intent, vision and a long-term view. You have a grand idea of what is truly possible, and you will stop at nothing to see it through. Unlike the Knight who can be a little impulsive with his actions, you have the maturity to see your vision through right to the end and beyond. You achieve a lot because you are clear about your future direction and how you will get there – and do not waste your time on activities or relationships you believe will lead nowhere. You never just go with the flow; instead, you prefer to embark on a direct and robust course of action. And you are inspired by long-term, sustainable success, wanting to have a lasting impact. You are here to leave a legacy. The appearance of the King of Wands also suggests that an opportunity is presenting itself to you, and you now have the power to take on the challenge. You are the determining factor in this situation. If you want it to be successful, it will. And equally, if you do not fully commit to it, this seed will struggle to blossom and grow. You can create any outcome you wish, so be mindful about your intentions and vision. You hold the power. The King of Wands reversed suggests that while you are in a leadership position, you are not ready to step into that role. You may be the creative or visionary person in your work, but you have not yet developed a sense of comfort with leading others towards your vision. You may need to work on your leadership skills or enlist the support of someone who has a natural talent at steering others towards a common goal. Alternatively, you may manage others, but are not leading others; you are assigning tasks and monitoring performance, but you are not communicating the vision and engaging your team to take responsibility for bringing the concept to life. You may think you are the only person who can make this vision a reality, even when your team is here to support you. At times, the reversed King of Wands can be aggressive and even arrogant in the pursuit of his goals. Be mindful that as you strive towards your dream, you are not putting others off-side, dis-empowering them or taking their contributions for granted. You need their support one hundred percent of the way. Also, don’t let success get to your head, thinking you’re above everyone else just because you are the leader. Consider embracing the concept of ‘followership’ – the ability to take direction, be part of a team and deliver on what is expected of you, even as the official leader of the group. On a personal level, the King of Wands reversed warns you against setting unrealistic expectations for yourself and others. While you are highly ambitious, you may be setting yourself up for failure if you set goals that are significantly out of reach and then pushing hard to reach those unattainable goals. You may also be prone to get swept up in the hype of other people’s goals to ‘10x your sales!’ or ‘create the next billion-dollar business!’ You don’t have to buy into other people’s dreams and visions (and hype). Stay true to what’s important to you and keep focused on your personal vision and direction.